Hey there! I have this layout for Hip Kit Club to share today. 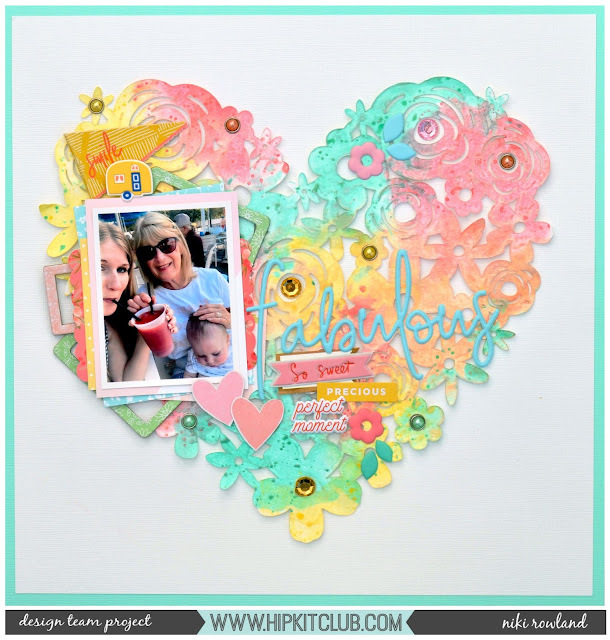 This went up for Mixed Media Monday and I had to incorporate a cut file in my layout. I cut the gorgeous Hip Kit Club cut file but left it on the cutting mat. I then applied the very gorgeous Opal Magic paints onto the cut file, using the packaging technique. I added splatters and also mixed some of the colours. Once it was dry, I very carefully peeled it off the cutting mat and then added it to my layout. I love the effect, it's so pretty. I kept the rest of the layout quite simple so as not to detract from the cut file background. There's a process video for this one which you can see below.